van der Stel, A. and Wösten, M. M. (2016). Campylobacter jejuni γ-glutamyltranspeptidase Activity Assay. Bio-protocol 6(5): e1747. DOI: 10.21769/BioProtoc.1747. The enzyme γ-glutamyltranspeptidase (GGT, EC 2.3.2.2) is highly conserved among eukaryotic and prokaryotic organisms (Heisterkamp et al., 2008) and has a key function in glutathione metabolism. Although the enzyme is highly conserved and found throughout organisms ranging from bacteria to plants and animals several major difference between eukaryotic and prokaryotic GGT can be noticed. They mainly concern the enzyme localization and posttranslational modification. Eukaryotic GGT is cell membrane anchored and highly glycosylated whereas prokaryotic GGT does not undergo this posttranslational modification and is a soluble periplasmic protein. GGT amino acids sequences of diverse origin exhibit high amino acid similarity (Ong et al., 2008). The prokaryotic GGT enzymes are produced as proenzyme, equipped with a typical prokaryotic signal sequence and transported through the inner membrane into the periplasm where the enzyme undergoes autocatalytic cleavage. This proteolysis yields a mature dimer which transfers the γ-glutamyl moieties from extracellular glutathione and related compounds to amino acids or peptides (Hanigan et al., 1998). The GGT enzyme activity can be easily measured as it catalyzes the transfer of a γ-glutamyl group from a colorless substrate, L-γ-glutamyl-3-carboxy-4-nitroanilide, to the acceptor, glycylglycine with leads to the production of yellow colored product, p-nitroaniline (Figure 1) which can be measured by a spectrophotometer (Figure 2). 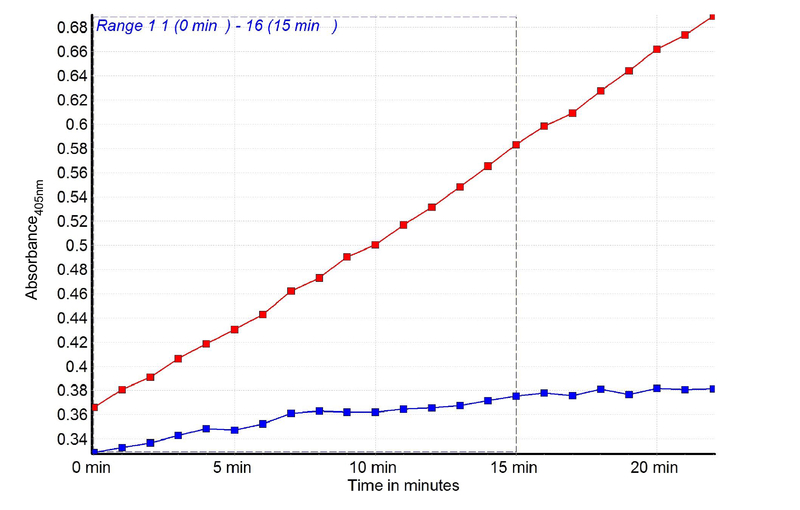 Here we describe a protocol to measure the GGT activity in the Gram-negative bacterium Campylobacter jejuni, with some minor modifications; this protocol also works for other Gram-negative bacterial species. Dilute a Campylobacter preculture in 5 ml Heart Infusion (HI) broth to an optical density 600 nm of 0.05. Growth the culture in vertically standing 25 mm culture flasks with vent cap in a microaerobic atmosphere (MART) at 42 °C, 160 rpm in HI broth for until stationary phase ~20 h.
Note: If other bacterial species are assayed use species specific growth conditions. Pellet ~1.109 bacteria of the bacterial culture, remove the supernatant and store the pellet at -80 °C for at least 1 h.
Note: The -80 °C freezing step will help to disrupt the cells, shorter incubation will lead to less disrupted cells. Resuspend the pellet in ice cold 250 μl lysis buffer, and incubated for 30 min on ice. Sonicate 6 times (5 sec each, with 15 sec intervals on ice) at 40 mV and the output control set at 80%. Centrifuge the cell lysate for 10 min at 12,000 x g at 4 °C. Harvest the supernatant and keep on ice before use. 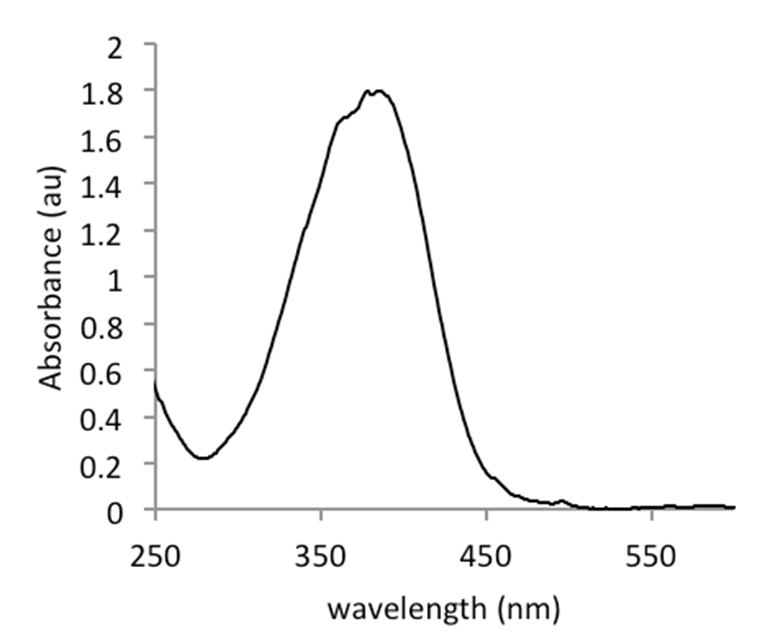 Measure the protein concentration of 20 μl supernatant (BCA kit with standard) in a 96 wells plate according to the kit’s protocol. Make a serial dilution in a range between 0 and 200 µM of the standard pNA [4-nitroaniline (stock solution 1 mM)] in 50 mM Tris/HCl (pH 7.6). Mix 20 μl supernatant or standard pNA in a 96 wells plate with 180 μl of reaction buffer. Measure the optical density of the samples and standard in the 96 wells plate at a wavelength of 405 nm (OD405) every 60 s during an incubation period of 30 min at 37 °C (Figures 3 and 4). Calculate the slope of all values in a linear range of the obtained graphs (see below). GGT activity is expressed as nmol min-1 mg protein-1. To calculate the GGT activity first plot the pNA standard curve. Calculate the Δabsorbance (A time x - A time y) in a linear range. 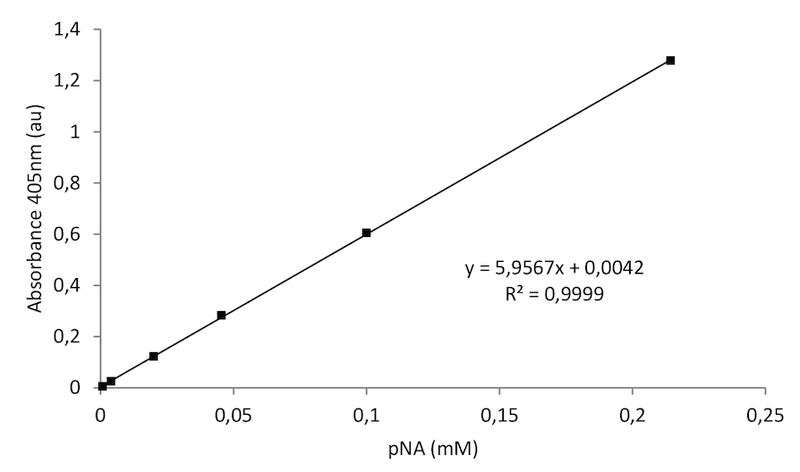 Next, compare the calculated Δabsorbance of each sample to the standard pNA curve to determine the amount of pNA generated between time x and time y (nmol pNA). The γ-glutamyltranspeptidase activity protocol described here and in, van der Stel et al. (2015), is modified from a protocol described in Chevalier et al. (1999). This work was supported by the NWO-ECHO grant 711.012.007 to MW. Chevalier, C., Thiberge, J. M., Ferrero, R. L. and Labigne, A. (1999). Essential role of Helicobacter pylori γ-glutamyltranspeptidase for the colonization of the gastric mucosa of mice. Mol Microbiol 31(5): 1359-1372. Hanigan, M. H. (1998). gamma-Glutamyl transpeptidase, a glutathionase: its expression and function in carcinogenesis. Chem Biol Interact 111-112: 333-342. Heisterkamp, N., Groffen, J., Warburton, D. and Sneddon, T. P. (2008). The human gamma-glutamyltransferase gene family. Hum Genet 123(4): 321-332. Ong, P. L., Yao, Y. F., Weng, Y. M., Hsu, W. H. and Lin, L. L. (2008). Residues Arg114 and Arg337 are critical for the proper function of Escherichia coli gamma-glutamyltranspeptidase. Biochem Biophys Res Commun 366(2): 294-300. How to cite: van der Stel, A. and Wösten, M. M. (2016). Campylobacter jejuni γ-glutamyltranspeptidase Activity Assay. Bio-protocol 6(5): e1747. DOI: 10.21769/BioProtoc.1747.